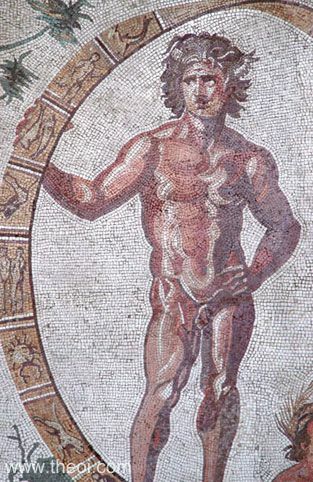 Aeon, the personification of time, stands holding a wheel inscribed with the signs of the zodiac. The signs visible on this portion of the ring are Capricorn, Aquarius, Pisces, Taurus, Gemini, Cancer and Leo. Aeon was probably equated with Chronos (Father Time) and/or Uranus (Heaven). He is often depicted standing beside Gaea (Mother Earth).